As everybody knows, there are alternate Universes with alternate histories floating around. This world is but one of those. I have just located one of those worlds and happy to show you a small part of that world that was revealed to me: There has been a tremendous upheaval and explosion. All the volcanoes in Iceland and the Italian peninsula simultaneously blew up, fracturing and scattering the earth crust. Fortunately Paris has remained in the same spot, but parts of France were thrown all over the drained Atlantic and Mediterranean basins. Your assignment is connect these cities and restore the French empire to its previous glory. Unfortunately the British Islands completely disappeared. I enjoyed playing this map, the land alterations were definitely a challenge. Nice and colorful. 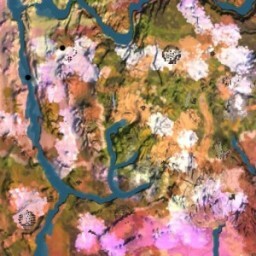 The colours look weird on the map. In the game, however, they’re very refreshing. Very easy to finish.